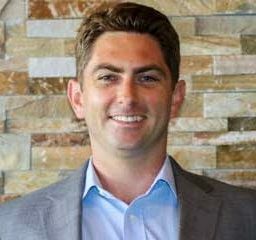 I’m Joe Gerrity, local businessman, investor and Real Estate Broker. For my monthly “Yo Joe!” column, I’ll be answering your real estate questions as well as providing market information and housing statistics. 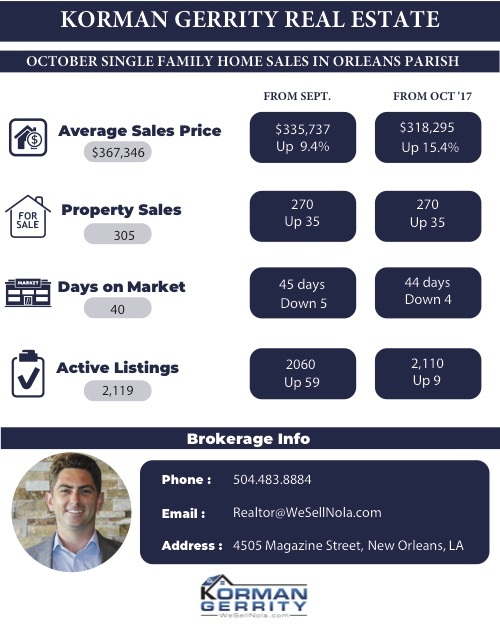 I believe the main responsibilities of a Realtor are to add value and facilitate mutually beneficial transactions, and through this column I hope to help the New Orleans community make more informed decisions about their housing future. Yo Joe! What do rising interest rates mean for the housing market? Generally speaking, it’s not great. While still not too far from historical lows, and definitely below the 30-year average, rates are rising across the board. From single and multi-family, to commercial and renovation loans, the cost to borrow money is going up. It’s increasing the cost to own homes, and in most cases, that is detrimental to a buyer’s ability to buy a home. There will be less buyers qualified to buy certain properties, and it may very well price certain people out of their preferred area. Another way to look at it is from an investing standpoint—most investors devise a formula to determine the value of a New Orleans home. A higher cost of borrowing money means the amount they’re willing to pay goes down. That same formula can be tweaked to some extent for most properties. Prices should be affected negatively as demand goes down. There are, of course, numerous factors that dictate housing cost that have little or nothing to do with interest rates: increased demand due to new jobs in the area, general economic growth, consumers seeing increased buying power, government incentives to purchase homes, increased supply due to developers misreading the market, decreased supply due to damage from flooding, etc. When trying to gauge what will come next, it’s important to take a broader view of the housing market as a whole instead of looking at one specific figure. Yo Joe! What are some extremely hands-off investments I can make in New Orleans real estate? The most hands-off that you can be in the New Orleans real estate market while still physically owning property is through something called a “ground lease.” This type of lease is an agreement in which a tenant pays for the right to develop a piece of property during the lease period, after which the land and all improvements are normally turned over to the property owner, although sometimes it’s required that the property be returned to its original state. Let’s say you own a piece of undeveloped land in the French Quarter. You may be approached by a developer who wants to build a Mardi Gras bead factory. You, as the owner, decide that you have no interest in selling the land, but are willing to give up what is effectively complete control of the property to this developer while still maintaining ownership of the property. Ground leases are normally long-term, as the developer will put significant capital into improving the property prior to even opening. You can write the lease such that the developer pays all insurance, property taxes, maintenance, etc. All you have to do is sit back and collect the checks. There are similar leases called “Triple Net (NNN),” which function very similarly, except in most cases there is already a structure in place which can be maintained either partially or fully by the tenant. Either of these options provides for what I like to call “mailbox money.” All you have to do is head to your mailbox and pick up a check. That’s all. Now you can even use direct deposit, so you literally don’t have to do anything to get paid. In both cases, you maintain ownership of the property while having little to no responsibilities. There’s also the more traditional route of purchasing a New Orleans rental property and having it professionally managed. This will reduce the amount of time you have to spend thinking or worrying about it (near zero in some cases), but you will have to be paying a property manager as well. On the bright side, a professional property manager can sometimes increase rents and decrease vacancies resulting in you actually making MORE money, despite doing less. Yo Joe! I want to flip houses in New Orleans but don’t really know where to start. What should I do to learn more? The best way to learn is to talk to someone who does it. I have around five projects going most of the time, and another Realtor who works in my office, Kat Womack, also flips professionally. Working with someone who has hands-on experience is definitely going to be the easiest way to find success. You’ll want to find an experienced New Orleans Realtor who has a firm grasp on not only how to find potential flips, but who also has a firm grasp on what you can expect for the post-renovation value. You’ll need to finance the project somehow, so a good lender is a must. A good realtor can recommend how to find money, but ultimately it’s up to you. Everyone flipping needs a couple good contractors who can bid the job and to the work on time and on budget. Depending on your own skill set, you may need an architect, an interior designer, a landscaper, and if you want to manage the project yourself, various other professionals. Yo Joe! What can I do about Sewage and Water Board or Entergy destroying the road or sidewalk in front of my home? Oh boy! I think if I had the answer to that I would run for mayor. First and foremost, if there’s a giant hole that could damage cars or swallow a pedestrian whole, I always try to put a traffic cone or garbage can it in so others who aren’t as familiar with the local pothole scene have a chance of avoiding disaster. Calling 311 is probably the best way to go after that, but I’d also recommend calling your City Councilman’s office. The staffers are almost always extremely helpful, and even if they’re not able to actually get anything done quickly, they’ll get the wheels turning. You can also try complaining directly to the entity that caused the problem. 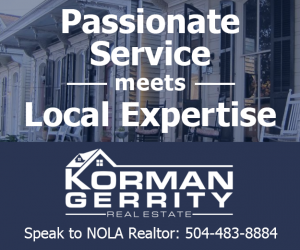 Joe Gerrity is the Broker and managing partner of Korman Gerrity Real Estate, a full service New Orleans real estate brokerage located at 4505 Magazine Street. He is also the managing partner of Big Easy Buyers, and a founding partner of both Crescent City Vape and Simply CBD. In a past life, Joe was a contributing sportswriter to ESPN. Learn more at wesellnola.com or email Joe a question at joe@wesellnola.com. Tagged with: housing, Yo Joe!